Even as Kangana Ranaut or Rani sparkled in Queen as a single woman honeymooning in distant Paris and Deepika Padukone convincingly managed her cantankerous father obsessed with constipation in and as Piku, it would be safe to assume that the average Hindi film heroine has come unshackled. But that assumption is brilliantly challenged by Deepa Gahlot in this book when she asks: Why has there never been another Fearless Nadia in Hindi cinema? Sheroes: 25 Daring Women of Bollywood is a stellar account of heroines in roles that debunk the traditional slots in an industry orchestrated by men and obsessed with the 100 crores phenomenon. From the fiercely independent Rosie (Waheeda Rehman) in Guide; the endearingly impish Manju (Rekha) in Khubsoorat; the feisty Damini (Meenakshi Sheshadri) in the eponymous film; the beauteous yet tenacious Zeenat in Dor, to the ambitious wedding planner, Shruti (Anushka Sharma) in Band Baaja Baarat, these and other actresses in the book took paths that were least travelled yet managed to create benchmarks in Hindi cinema. 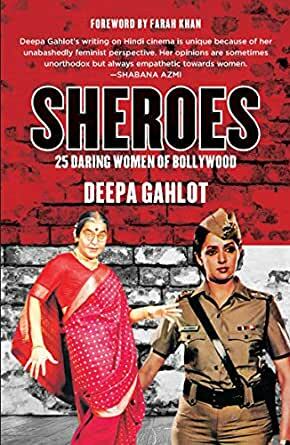 A mandatory read for every lover of Hindi cinema, Sheroes is pathbreaking as it showcases heroines who explode the stereotypes in a male bastion with incredible chutzpah. Deepa Gahlot is currently head of Film and Theatre at the National Centre for the Performing Arts (NCPA), Mumbai. She continues to write on cinema and enjoys bad films as much as she admires good ones. She listened to film stories as bedtime tales, and grew up in love with the movies. She has been reviewing films for the better part of a quarter century and the romance hasn’t faded away, though familiarity has bred some contempt. An amazing book with the collection such intriguing female characters of Hindi Cinema since the age of an Oscar nominated Mother India till the recent Mardaanis of bollywood. I wonder how did this book go unrated for so long. Deepa ma'am, I have recently authored a female oriented book (of Urban India) with the title - Maiden In Pursuit..The story of this common Indian girl..Romance, Heartbreak, Philanthropy. The book is available on Amazon (published through KDP). Please do give it a read & I would look forward to your valuable review too. Thank you so much for Sheroes.